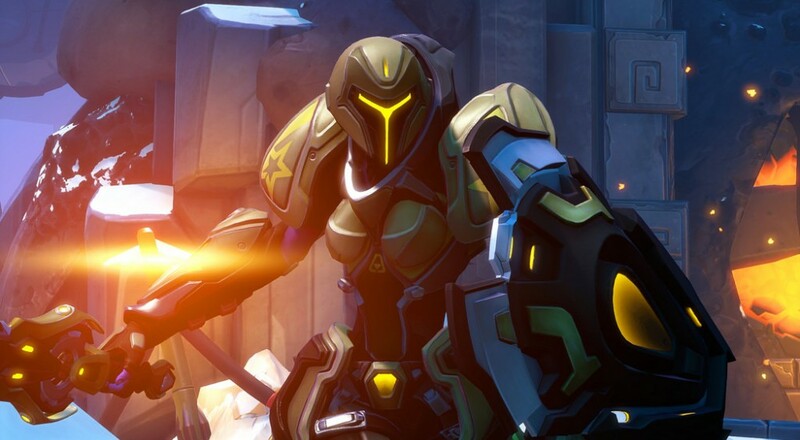 Gearbox has really been stepping it up with the hero reveals for its upcoming "hero shooter" Battleborn. Two more heroes have just been announced for the game, both of them hulking monsters. They go by the names Attikus and Galilea. Attikus was an intelligent enslaved beast forced to toil in the mines of Tempest. Now he uses his biotech-granted intelligence and his massive brute strength to fight back against his oppressors. He excels in pouncing into the thick of things and unleashing devastating blows with his fists. One of his arms is encased in metal which can really bring the pain - it can even shock people. He can also repel enemies with powerful shockwaves. Galilea used to be an undercover agent with a promising future. When her mission went terribly wrong, she was infused with a terrible dark energy, granting her immortality. Now, she uses a greatsword in one hand to cleave through enemies while wielding a greatshield in her other to protect her allies. She specializes in debuffs and can even hurl her shield from afar if the situation warrants. Remind you of any other Gearbox heroes? These sound like great characters for players who really like to be in the thick of things and be a tanky beast. Battleborn will support 2-player local, 5-player online, and combo co-op on PC, Xbox One, and PS4. It's due out May 3rd, 2016.